For years, dive sites in Nusa Dua were losing the popularity battle against other sites in Bali, such as Tulamben in Karangasem regency and the world in renowned sites off Menjangan and Nusa Lembongan islands. Hide and seek: This photo taken by Divo Ario shows a blue-spotted ribbontail ray and a brown banded bamboo shark hiding underneath hard coral during daylight hours. That may change soon after an inaugural underwater photo competition revealed the majestic beauty of Nusa Dua’s underwater dive sites. Held from May 3 to 6, the first Badung International Underwater Photography Competition saw participating photographers explore several dive sites off this popular tourist area. The pictures they captured spoke of a mesmerizing underwater landscape rich in stunning creatures — a testament to Nusa Dua’s birthright to be acknowledged as one of the island’s best destination for diving and underwater photography. As many as 18 participants from five countries like Japan, Australia and the Netherlands, competed in the event, taking their best shots during four dive trips. Participants were allowed to take macro or wide-angle shots and asked to submit five different photographs to the panel of judges comprising underwater photographer and scuba diver Arief Yudo Wibowo, underwater photographer and dive instructor I Made Widana and marine biologist and senior adviser to the Nusa Dua Reef Foundation Jamaluddin Jompa. Funded by the Badung regency administration and organized by Diver Peduli Laut Nusa Dua, the competition is slated to become an annual event. “Nusa Dua has great underwater beauty and is full of macro critters. This competition was good way to introduce Nusa Dua to the domestic and international diving scene,” participating photographer Anak Agung Anom Sangku said. Sangku’s photograph of a blenny was chosen by the judges as the winner in the National Open category. Meanwhile, the macro photo of a lizard fish eating a prawn by Djihadi placed second in that category. Stand out: Philippe Eggert captures a phanero-branch dorids, whose spots are contrasted against the Xenia, a species of soft coral. 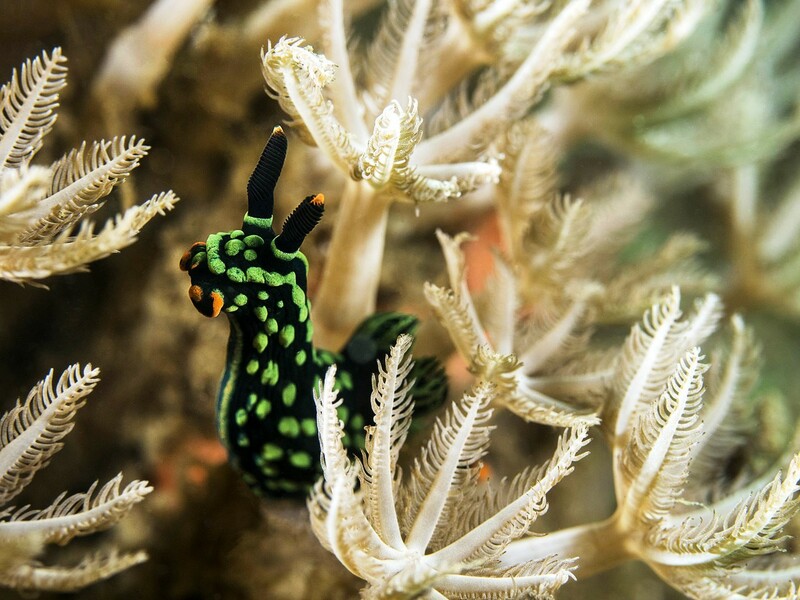 Another participant, Bali-based Swiss photographer Philippe Eggert, suggested that the rich underwater life in the waters off Nusa Dua was due to the rich nutrients carried by the Indian Ocean, the region’s huge waves and strong current. “Nusa Dua is not an easy dive site and I would recommend it to advanced divers and underwater photographers only. It is not easy to take good photographs but the work and effort are worth it. I found really cool critters in Nusa Dua,” he said. The underwater landscape is home to various species of nudibranch, a shell-less marine snail of the suborder Nudibranchia. The “nudi” in nudibranch means naked, and the “branch” means gills. Their scientific name translates literally as “naked gills”, because their breathing apparatus is generally exposed. Two photographs of nudibranch won top places in the competition. The brilliant color pattern of Flabellina exoptata by Haryanto took third place in the National Open category and a phanero branch Dorids spotted contrast on Xenia soft coral by Philippe Eggert placed third in the International Open category. Nusa Dua is not only rich in macro critters, it also has charismatic marine species such as sharks and rays. 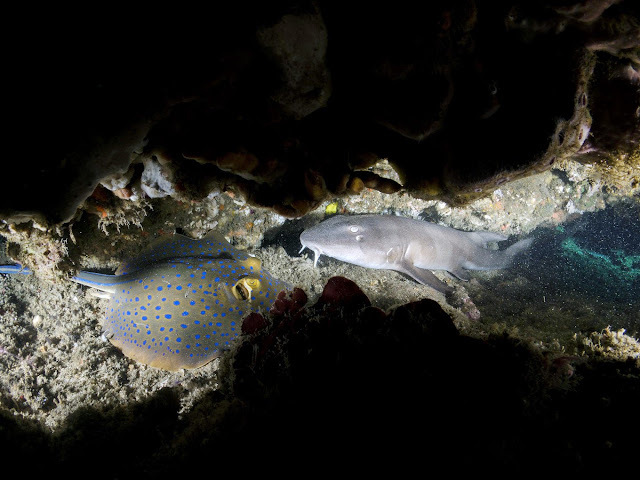 A picture of a blue-spotted ribbon-tailed ray with a brown banded bamboo shark hiding below a massive coral in daylight by Divo Ario was chosen as the winner in the International Open category. As a nocturnal feeder, this shark, measuring up to 1.04 meters in length, becomes more active at night when it excavates the sediment in search of prey. While adults are overall brownish with faint suggestions of bands, the commonly seen juveniles are distinctly barred, dark and pale. These sharks are vulnerable to losing their habitat due to pollution and overfishing.